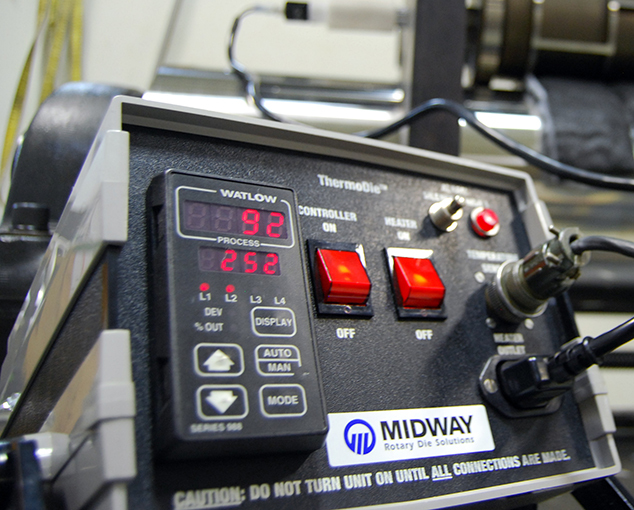 The Midway ThermoDie™ Infrared Heat Controller uses a non-contact heat sensor to accurately hold surface die temperature to +/-2 degrees Fahrenheit. Using Programmable Internal Digital software, our controller offers the user the ability to reproduce accurate seals over and over without temperature overshoot. Used extensively in heat-sealing applications, this highly accurate heat controller uses 110-volt electrical current and is easily moved from machine to machine. Solid-state components offer years of service with extremely high accuracy. The unit comes complete with rotary coupling, heat cartridge, instructions and 1-year warranty.